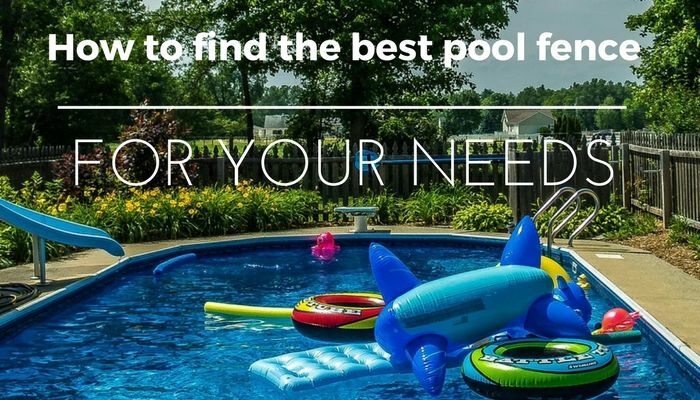 Best Pool Fence Reviews 2019: Find out The TOP 7 choices! Pools are a wonderful source of entertainment and comfort when the weather gets warmer. But, the risk of drowning is too high to leave your pool unprotected all the time. To help mitigate the drowning risk, there are many laws in place in various countries about installing pool fences. In the US, for example, homeowners’ insurance policies require pools to be fenced. I want to teach you how to read pool fence reviews and get the right information, so you can make the best decision. 3 What Are the Pool Fence Styles? 4.6 6. 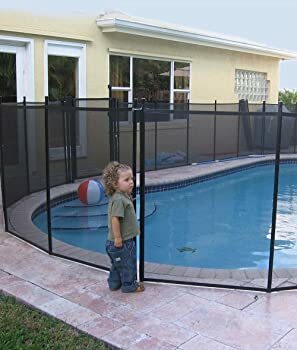 Traditional 4×7 feet (HxW) Pool Fence ByWam Bam Fence Co.
Children are known for being able to climb well, so it’s important to make sure your fence doesn’t give them that opportunity. There should be no easy places to hold onto or stand on to climb over the fence. Fences need to be tall enough to block people from entering easily. Your local area may have a specific requirement about height. Check with the relevant authorities to make sure you meet the height requirements completely. There should be little to no space between the bottom of the fence and the ground. If the ground clearance is too high, children and adults may be able to go underneath the fence easily. Fences can be made with a variety of materials of different prices, sturdiness, and appearances. Not all materials will offer the same safety benefits as others. I will talk more about these material types later to help you make a clearer choice. Some fences have vertical slats made from wood, metal or another hard material. The gap between fence pieces should be small enough to keep small children from climbing through the fence. Most fences come in kits that you will have to put together for yourself. The method of connection will help you know if the fence will be safe or not. Are the pieces well attached to each other, or are they loosely fitted and flimsy? These questions will make a big difference in overall safety of the fence if you’re buying a kit. Aluminum used for pool fences is usually powder-coated, a method that makes it highly resistant to the elements. These fences are popular because they don’t need a lot of work to upkeep and they look a lot better than many other types of fences. Most ornamental aluminum fences do not work as privacy fences, so if you want to have a fence that blocks view to your pool or yard, this is not the best type. PVC materials are very strong, and they can be made into many different designs of fences. Since PVC is a hardened plastic material, it is capable of resisting weather elements quite well, although it’s not as sturdy as aluminum fencing. PVC fences can be used as standard slat fences or privacy fences, depending on how they are installed. As the classic fence building material, wood has been used in this role for decades. It’s strong, versatile, and able to be styled however you want. While wood does usually require more maintenance, it also offers you more choices in appearance and design. One of the main benefits of wood fencing is that it’s cheaper than the other two materials, so you can much more easily install a properly sized fence on a budget. 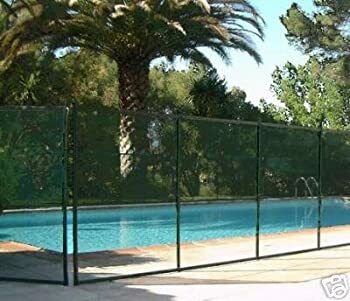 While these are not the most reliable types of pool fences, mesh fences are available and legal in some parts of the world. 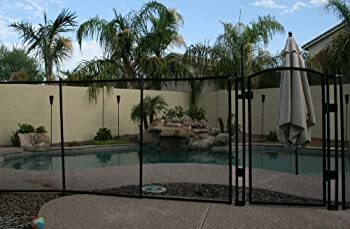 Sturdy mesh links together inside square fence pieces, blocking off the pool area while still allowing you to see through the fence fairly well. Pool fences made from glass are beautiful and functional, but they are much more expensive than more other fence types. Glass pool fences allow you to retain your beautiful yard without ruining the view with a bulky fence. They are, however, expensive and not always practical in areas with unpredictable or severe weather. 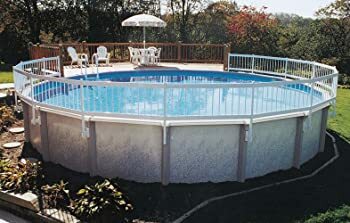 What Are the Pool Fence Styles? As long as the style you want meets all the legal requirements in your area, you have the freedom to choose what it should look like. 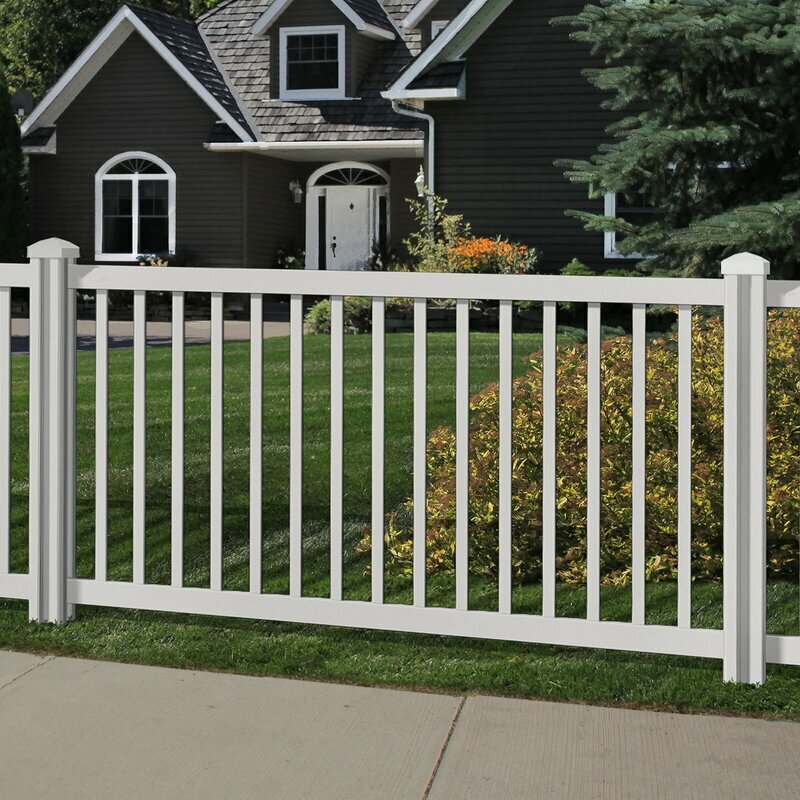 There are a few main styles that many people choose from when it comes to metal, wooden, and PVC fences. This is the basic style of most pool fences, where vertical bars are connected to each other by horizontal bars near the top and bottom of the fence. A double-top fence is the same as a flat top, except that there is an extra horizontal bar close to the top bar. Usually, ornamental details are included between the two closest bars. Instead of each vertical bar being a separate piece of metal, a loop-top fence uses long pieces of metal to create two bars. At the top, you’ll see the signature loop as the metal curves to fit the design requirements. Most metal fences are made with hollow metal tube-style bars, but these types are made with thick metal wire bars instead. The result is a more durable and weather-resistant fence material. To give you a better idea about your choices for pool fences, here are a few pool fence reviews for you to check out and get a feel for what’s out there. This is a simple mesh safety fence for your pool area. It’s not meant to be a privacy fence or to block off your whole yard, but it’s an effective way to keep children out of the pool area. If you order this particular kit, it is only the fencing material itself, without a gate included. The hardware for setup, a measuring template, instructions, and an installation video will be included in the kit with the fencing. If you’re a do-it-yourself kind of person or are capable of doing some small drilling work, this fence won’t prove to be difficult for you at all. It’s easy to set up on your own and compatible with a variety of safety gates you can purchase from the same company. You can get the fencing in either 4 or 5 foot height with 12 feet of length per kit. Not a good option for large pool areas, as this section of fencing is only 12 feet per package. Another mesh pool fence, this is made from a durable mesh material that will resistant outside weather, tears, and fraying to keep in good shape for years. It’s a basic safety fence that works well to keep children from approaching the pool unattended. The support poles are made with black powder coated aluminum, a sturdy, yet light-weight material. This is an easy installation, although you will have to have a good electric drill and some patience to make the laborious task work for you. 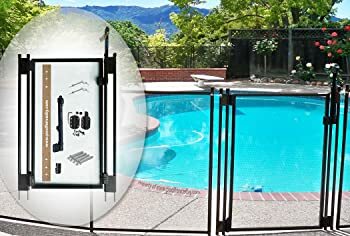 While this is not a pool fence itself, this is a great kit for installing a self-locking gate to your mesh safety fences. It is a 4-foot-tall gate with a 2-foot-wide entry area. The self-closing gate has a built-in magnetic locking system that keeps it secure from children. The powder-coated aluminum poles used to support the mesh are sturdy, weather-resistant bars that help prevent the mesh from fraying as well. Installation requires a rotary hammer drill and a long shaft masonry bit, which are not included with this kit, but can be rented individually. Made from a hefty resin material, this pool fence takes virtually no maintenance to keep it strong and looking good. 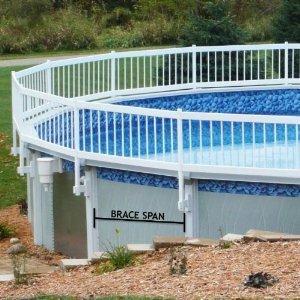 It attaches directly to the existing braces of your above-ground pool, and cannot be built around the yard with this kit. All hardware is included for the installation, but you may need to rent some power tools to make the installation easier for yourself. Fence spans come in at 60 inches long each, to accommodate different brace sizes, and can be cut to length with a saw as needed for your specific pool. Everything you’ll need to set up the fence is included in this kit, so it has the fencing pieces, posts, instructions, and all the hardware it needs. This fence is only for above ground pools, but it’s attractive and works well for protecting the pool area. You can connect this fence to any existing fence if your above ground pool is built into a deck. 6. Traditional 4×7 feet (HxW) Pool Fence ByWam Bam Fence Co. Different styles and designs of swimming pool fence have emerged on the market recently. But if you want to stick to the traditional pool fence, then we’ve got a great option for you. This pool fence by Wam Bam Fence Co. has a classic look to it. Thus, it won’t ruin the aesthetic appeal of your pool area; it’ll enhance the overall look instead. This pool fence measures 4 feet in height and 7 feet in width. This pool fence has a beautiful design that can instantly revamp the look of your pool area. You’ll also get a fence anchor when you purchase this pool fence. The best thing about this pool fence is that it is customizable. Hence, you can modify the design or the style to make sure it fits the overall ambiance of your pool. Made of vinyl material, this pool fence is not easily damaged. Aside from its beautiful design, this pool fence is also noted for being durable and strong. You need the right tools to install this pool fence. Some users suggest asking the help of an expert during installation. It is also a bit time-consuming to keep and store. The problem with the traditional pool fence is that it is usually a hassle to remove the fence every time you want to use the pool. Now, this issue has been answered with this mesh pool fence by Giantex. 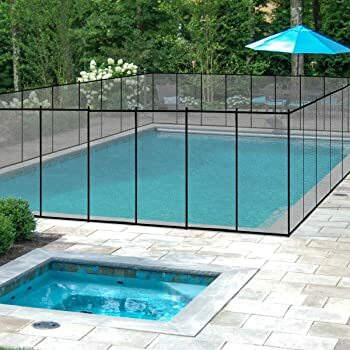 A mesh safety pool fence is a lot easier to keep and store. In addition, this type of pool fence is also lightweight. The installation and storing steps are both easy and fast. You need an extra hand to set-up this pool fence. Best suitable with inground swimming pool to prevent the accidental drowning of children and pets. It also features Aluminum foot tube that is both strong and lightweight. So, transporting this fence is easy. Also, this can last longer than you think when taken care of properly. You can roll up this fence when not in use. Therefore, this is true to its claim about easy storage. The package is complete with all the necessary hardware needed for the installation and of course, the instructions to follow. Creating some cement blocks to act as posts for the pool fence is a must. Otherwise, the pool fence can be easily toppled by the strong wind. The installation is easy, but you need to buy the necessary tools to make sure that the fence is secured and that it does its job accordingly. Another magnificent pool fence option to consider is this 4×12 feet pool fence by Sentry Safety Pool Fence. This pool fence is also a mesh fence, which helps prevent children and even pets from drowning in the pool. Some users are impressed with the product while some say they’ve seen better pool fence. However, it cannot be denied that this pool fence has its own advantages. Since this is a mesh fence, it is then a transparent fence. This means that using this pool fence won’t block the view of your pool. This fence comes pre-assembled in 12 ft sections, in which every 3 feet is supported by a pole. You can also customize this mesh pool fence should you feel like it. This is a guarantee that you will get the pool fence that fits your pool ideas. The most amazing featureof this fence is it being rust-proof. It has a three-layer design, but each layer is coated with aluminum so that the fence can withstand extreme weather conditions. Using a power drill is recommended during installation. Installing this one is best handled by professionals. It’s important to choose the best pool fence to fit your needs. The right fence will help to meet any local legal or insurance requirements while also reducing the risk of drowning in the pool. I have suggested a few simple pool fences that offer a good value in the above pool fence reviews, so you can start your search there for a good idea about what’s available for you.